Some friends are arranging a small Age of Sigmar tournament as an incentive for getting more things painted up. Tournaments are also a real cost efficient way to get some table top time. During a day you can manage quite a few games, which is always a good thing. With the new generals handbook coming to AoS I thought it was the perfect opportunity to get on board. 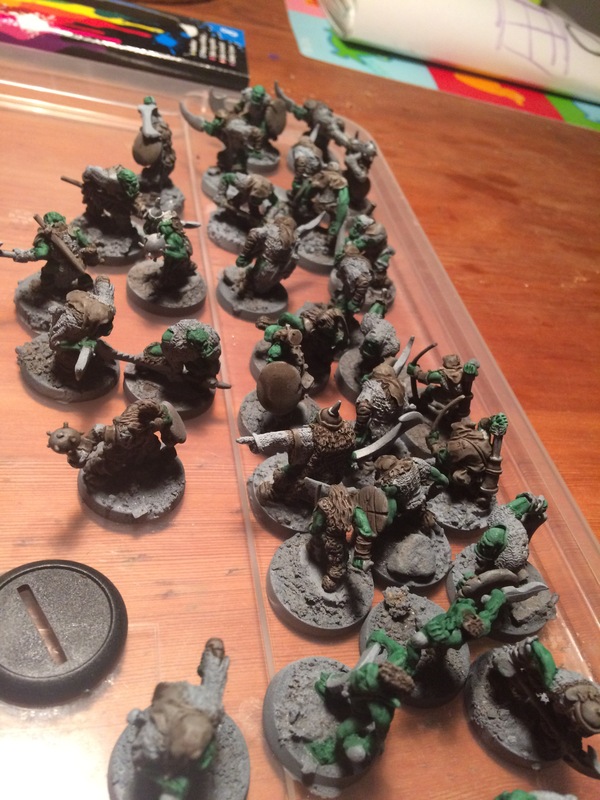 Since I already hade a sizeable Orcs & Goblin army so i thought that shouldnt be a problem. Thing is that it all needed rebasing because of the exploding world phenomenon. Going through the pile looking for suitable miniatures to represent my general I went for an older orc shaman, one I hadn´t painted yet. The miniature in question was the orc shaman riding a war wyvern from Marauder miniatures range. But instead he´ll be mounted on a sabretooth tiger (with an additional head added), counting as a war boar which is a legitimate option on the orc great shaman warscroll. I also realised that there were quite a substantial amount of unpainted lead in the vault. So instead of just rebasing I entertained the idea of painting instead of rebasing and in doing so making my greenskin collection even greater. But most important greener. So all in all there´s about 82 miniatures to do before the tournament which is only 6 weeks away. Will it suffice? Hope so, if time runs out I might just rebase some of the already painted stuff but that´s plan B. First out are a bunch of black orcs scuplted by Nick Lund. The miniatures are from Grenadier, Chronicle N11 and the Citadel regiments of renown (Eeza Ugezod´s mother crushers RR18) series. They will be accompanied by Jes Goodwins Despoiling hobgoblins of the Darkland (RR 15) and some newly sculpted Feral Goblins by Kevin Adams from Knightmare Miniatures. Some c36 Hobgoblins ill also be there. All of these will form a 60 heads strong horde of Gitmob Grots for the purpose of the game. It will be 1000 points in total, and apart from the general and the grots there will be trolls/troggoths, orcs/orruks, ogres/ogors, a boar chariot and some gore-gruntas (a sort of orc boar boyz). It will be some sort of grand alliance of Destruction, and it will be awesome.